The FLAGMAN-CODE complex is designed to diagnose Common Rail injectors of Bosch, Denso, Delphi, Siemens VDO on the test bench. Checking the injectors is provided by feeding the control signal from the controller to the tested injectors and maintaining the required pressure in the system according to the selected test plan. 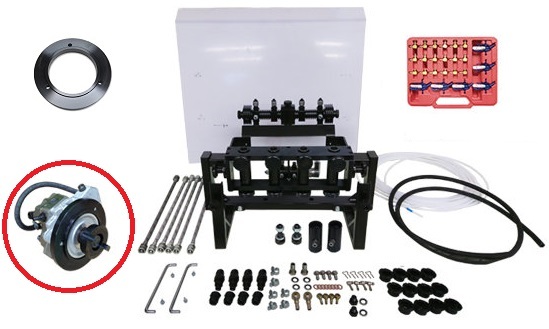 control of the measurement of the flow and backflow of the injectors. * Functions are optional and are not included in the basic version of the complex! All the management of the complex is carried out with the help of the program “CASCADE” and a personal computer. About 40 MB of disk space to install the program. 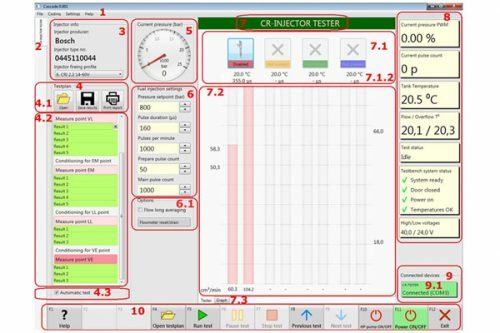 Using the “CASCADE” software, the “CR-Injector-Tester” controller is connected. Controller “CR-Injector-Tester” is designed to provide programmable control signals for the pressure regulators of the test system and CommonRail injectors. 2. The mode selection tab “CR-Injector-Tester”. 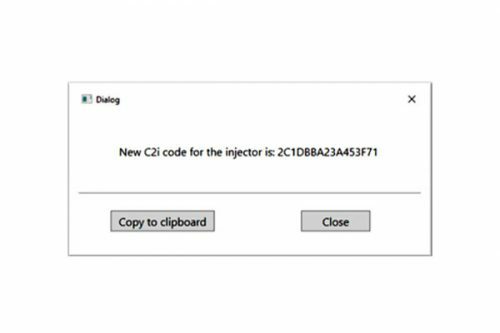 3.The “Injector Info” (information about the injector). 5. The pressure gauge section “Current pressure (bar)”. 6.The section of parameters “Fuel Injection settings”. 7. Tab “Tester” – display of virtual flasks and parameters. 9.The “Connected Devices” unit showing the connection of devices. 10.Functional buttons of the software “CASCADE” – F1 … F12. It is possible to set the encoding for an additional order. To encode the injectors, you need to get the test results. To do this, you need to select from the list of test plans by the number of the DELPHI injector. Open in the “Code with user target” or “Code with factory target” mode. After the end of the test plan, you can see the schedule and, if necessary, improve the results. 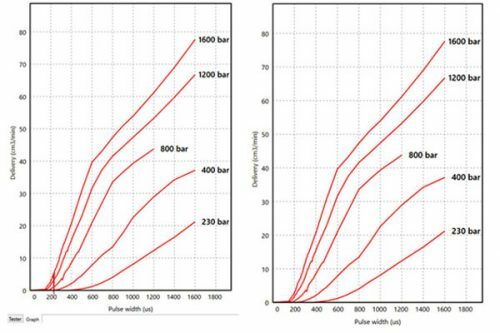 The graph on the left shows incorrect result. In the graph on the right, the corrected result.To get the code, you need to click the “Get C2I code” button in the menu.